The biggest challenge for small businesses in India is not about finding the right talent, but retaining your most valuable employees. One way to keep trained and experienced SME staff from leaving is to offer perks such as employee health insurance that they might lose if they quit. This is a perk that is at present barely offered by India’s SME sector to the over 60 million strong workforce. According to IBEF data, the country’s insurance sector premiums account for less than 1.5% of the total global premiums, but the size of the market is expected to quadruple from the current $60 billion over the next ten years. In the near future, every business in India, no matter how big or small, will likely be required to offer group health insurance for all employees. You can stay ahead of the curve by putting your employees’ health first right away. Evoma safeguards the health and safety of its workforce through a group health policy for our business center employees. We strongly encourage all our member businesses and entrepreneurs to do the same, and get business and health insurance to ensure the safety of your business and all your employees. As an SME looking to recruit, hire and retain the top talent in your sector and industry, these are the affordable health benefit plans available for Indian small businesses. HDFC Ergo provides customized group policy plans based on your company’s specific needs, with a single policy to cover all your members. This ensures lower premium costs, and an incentive for the affiliation with the group. This policy, as a supplement to a group health insurance policy, takes care of hospitalisation costs due to sickness (up to Rs. 5,000 per day), and incidental costs (up to Rs. 10,000 per day) related to hospitalisation for accidents. There’s also a reimbursement benefit for medical bills related to accidents, whether or not it needs hospitalization. First month premium during review period is only Rs.10, and the regular premium follows from the second month onwards. The base cover includes hospitalisation and ambulance costs, pre and post hospitalisation costs, day care, home care, and donor expenses. Optional covers include direct and reibursement plans, cost sharing, corporate buffer, family benefits, health and wellness, waiting period waiver, etc. It includes in-hospital AYUSH treatment coverage, and a optional choice of maternity, dental, OPD and other healthcare needs. Covers costs of surgeries and procedures that require less than 24 hours of hospitalisation, and medical expenses for hospitalisation of more than 24 hours, and 30 days pre-hospitalisation plus 60 days of post-hospitalisation costs. Family floater benefit included, where any member of the family can avail of the Floater sum insured. Additional premiums can be paid for optional items such as pre-existing diseases, maternity, and extended coverage (in addition to hospital costs) for major critical illnesses. 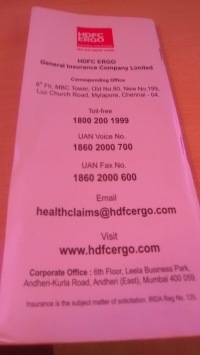 Cashless claims at network hospitals, and claim forms at non-network hospitals. This policy covers almost all expenses from the time your employee is hospitalised to the time when they get discharged. Offers cashless facility, allowing the insurance company to settle your employees’ health bills directly with the hospital.